This release puts Circus in a whole new dimension because, amongst many small features and fixes, we have added socket support. What are Circus Sockets ? The main idea is that a child process that's created by Circus to run a command, can inherit from all the opened file descriptors. Why would you do this ? To manage all the processes that compose your full web stack in a single tool for example. Let's take an example with a Python WSGI web stack -- but that would work with a Ruby or Java stack. If you want to make sure the Gunicorn process stays up and running, you have to use a program like Supervisord or upstart. This is true for Gunicorn and most multi-processes WSGI servers out there I know about. uWsgi is a bit different as it offers plethoras of options. But if you want to add a Redis server in your stack, you will end up with managing your stack processes in two different places. 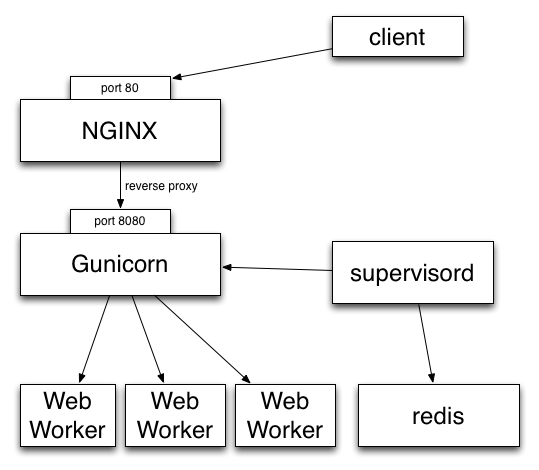 So, like Gunicorn, Circus is able to bind a socket that will be proxied by Nginx. Circus don't deal with the requests but simply binds the socket. It's then up to a web worker process to accept connections on the socket and do the work. It provides equivalent features than Supervisord but will also let you manage all processes at the same level, whether they are web workers or Redis or whatever. 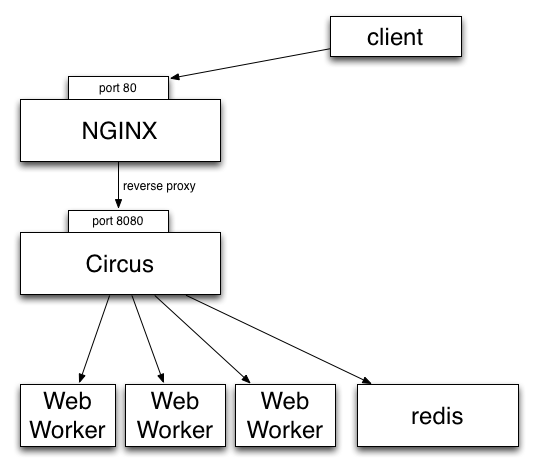 Adding a new web worker is done exactly like adding a new Redis process. But enough theory, let's see how you can run a stack. For this you need Circus and a process that accept connections on a socket Circus binds. Chaussette is exactly that kind of program. $(circus.sockets.web) will be replaced by the FD value once the socket is created and bound on the 8000 port. For 0.6, we're focusing on adding security and clustering.